Taine Rose shows off the medals he earned this year at the NZ Ironman event and the Port of Tauranga Half Ironman. Hot on the heels of completing in his first Ironman event in March, ex-CHS head boy Taine Rose is already preparing for his next adventure – competing at the Long-Distance Triathlon World Championships in Denmark this July. Taine has been training ten to twenty hours a week in and around Cambridge, juggling his sporting ambitions with his job at Agrowquip. 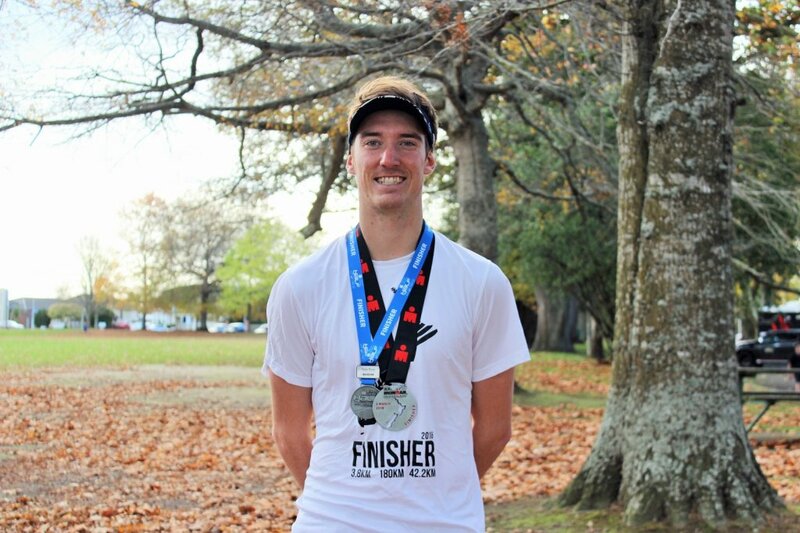 The 2016 Cambridge High School graduate will swim 3km, cycle 120km and run 30km at the Denmark event – only about three quarters of the distances he completed at the NZ Ironman event in March, where he placed 6th in the 20 – 24-year-olds’ age group – and third out of the New Zealand athletes in that division. Taine finished the mammoth March mission in ten hours and 49 minutes, having swum 8km, cycled 180km and run a full marathon distance of 42.2km. Taine said the best part about attending the Ironman event at Taupo was being around so many like-minded sports fanatics. Taine’s qualification for the Long-Distance Triathlon World Champs actually came when he competed in the Port of Tauranga Half Ironman earlier this year, where he won his age group. Heading into the international event, he hopes to make it into the top 15. “That’s what I’m aiming for,” Taine said. His cousin Conan Hansen, who has completed several Ironman events, is helping and advising him in his training methods, and Taine is also being supported by NZ Louvres, Agrowquip, and Cambridge Accountants, whom he wished to thank, as well as his training partners here in Cambridge. And the journey won’t stop in Denmark, afterwards Taine will start training for next year’s Port of Tauranga Half Ironman and the full NZ Ironman, aiming to win his age group qualify for the world Ironman event in Hawaii.